Compared with our standard "PP module"
has to be installed by our mechanics - please ask for an individual offer. 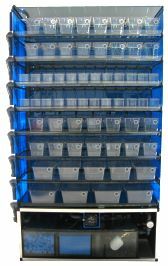 Due to your individual requirements, rows can be filled with AquaBoxes of the following sizes: 1, 3, 5, 7 and 15 (click for details). Water supply of each box is in the back over single water-supply lines with miniature valves for flow control at each of them. Drains are in the front over a sieve (AquaBoxes 3, 5, 7 and 15) or a small slit (AquaBox 1). ATTENTION: The AquaBoxes 3, 5, 7 and 15 (> without lids, sieves and other additional equipment) are made of autoclavable (up to 121°C / 250°F) polycarbonate (PC), except our "AquaBox 1" (1 litre).